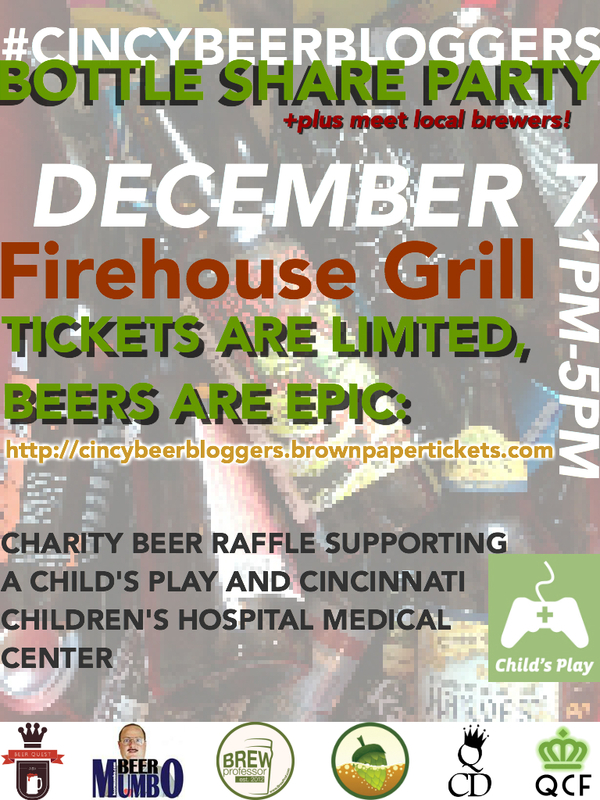 The event is on December 7th at Firehouse Grill in Blue Ash. Space is limited so act fast and order a free ticket (they’re free and just to control the number of people) at http://cincybeerbloggers.brownpapertickets.com/. We ask that everyone bring a bottle or two of their favorite beer to share, don’t worry about something rare just bring something you like and want to share. If it happens to be rare then that’s good to. The holiday season is upon us and while we all want to get together for a good time we must remember those less fortunate. At this event we will be doing a fund-raiser raffle in support of Child’s Play Charity, which gives video games to children’s hospitals, and Cincinnati Children’s Hospital Medical Center. So please bring money to buy raffle tickets, and if possible something to give to the raffle! The raffle will mostly be bottles of beer from our cellars but we’re hoping local breweries and bars will pitch in items as well and if all of you can bring something this could turn into a huge fund-raiser! Firehouse Grill has been kind enough to host this event for free so we urge you to buy a plate of their fantastic food or one of the many local craft beers they have on tap. Both to help them out for hosting the event and to make sure no one gets too wasted from trying all the delicious beer!